I breathed air underwater today! Hi, dear reader! This is an old post from a travel/adventure blog I used to keep. This is my second post from my old job as a Waterfront Intern at the School for Field Studies Center for Marine Resource Studies in the Turks and Caicos Islands, all about learning how to drive the boats and our first dive! Ahhh I miss that water…. That’s what James, my supervisor, said the students are thinking when we take them on their first dive, and therefore we should go at a pace that we find unbearably boring. Though, with the amount of work it’s looking like we’ll be doing, I don’t think I’ll mind a lethargic pace. Today, we went diving (horay!) this is significant not just because it’s a huge part of our jobs and one of the main reasons we’re all down here, but because it means James is getting comfortable with us driving the boats, since one person needs to stay behind and boat sit (exactly what it sounds like) while the others dive. As I mentioned before, we have three Carolina skiffs (21, 23, and 24ft). They’re flat-bottom boats with outboard engines and they all drive differently. We spent Sunday afternoon and all of yesterday learning how to drive them. First, we practiced docking, then did man-overboard drills, coming up to a mooring, and driving in shallow water. The last piece was the scariest. The first time we took the boats out with James and one intern on the 24, then two interns on the 21 and 23, my boat hit…something. We were coming back to the dock from the shallows and had received no instruction on how to read water depths or what to do in shallow water, other than to tilt the engine up. We didn’t damage the propeller, but the experience was enough to make me wary. Today, we took the boats into deep, blue water for the first time. 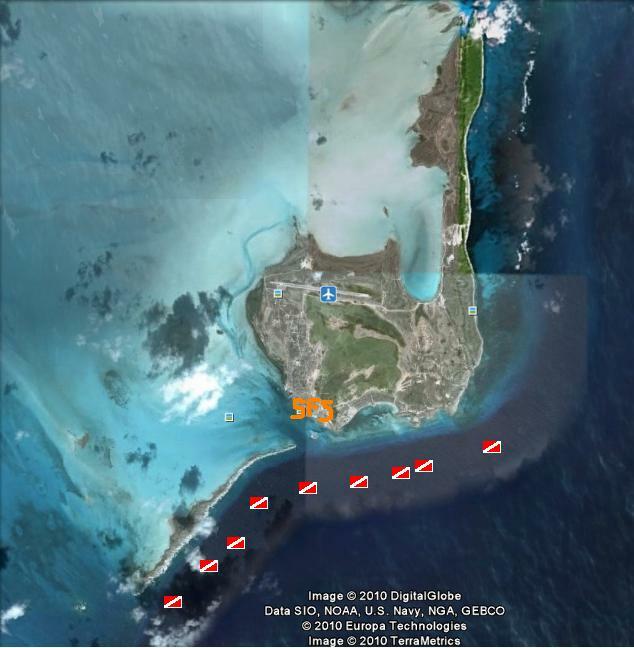 South Caicos is shaped like a hook, or a backwards 6, with the shallow water of the Caicos Bank extending from the top of the island to the bottom of the hook on the West side. On the East side, there are a few cays and some shallow water close to the island, but the water very quickly drops off to thousands of feet at the “wall.” That’s the Atlantic Ocean. There’s a huge difference between driving in the shallow areas and out in the ocean where the waves are bigger. There’s a prevailing wind and current always coming from the East, so at least it’s predictable, but in these flat-bottom boats, driving becomes an exercise in controlled fearlessness. If you’re going too slow and the boat isn’t on a plane (with the bow in the air, traveling over the waves), you may take waves over the sides or the bow, flooding the boat and rocking the passengers around; with heavy dive gear, it can be dangerous. Therefore, you need to maintain some speed, but the driving has to be precise. Instead of traveling in a straight line, the best way to drive is to travel at an angle to the surf so the boat rolls over the waves. Then, you zig-zag to your destination, always turning in the trough (lowest part) of the wave, lest you take a wave at a bad angle and lose control. Anyway, it’s exhilarating, at least without any students on the boat and another intern standing nearby to help. The open water driving was some of the most fun I’ve had in the week that I’ve been down here. By comparison, the diving was tame. We did two dives today and will do two or three a day for the rest of the week before the students arrive on Monday. James’ goal is to get us comfortable with the sites and with the process of leading new divers. I had to adjust to his pace (I was often, essentially, tailgating), but otherwise, the diving is easy with great visibility, even though today was not as good as it usually is (the horror, 50ft vis!) I’m excited to keep diving and to see some sites and some areas that we didn’t dive as students. Along with the boat training and diving, we also went on two snorkels today, one to get acclimated to the closest site and one to check a missing mooring. On the first snorkel, we saw a school of about 15 barracuda, including some 4-5 ft angry-looking, black ones. I’d forgotten how much I hate them. They scare me more than anything else on these reefs. The gorgeous reef at one of our snorkel sites. Lots of fire coral, however, so a good incentive to not get too close! I am also on compressor duty this week. We have a rotation of chores for the week and I’m the first to run the air compressor for the scuba tanks. James ran us through how to operate it, but I’d already forgotten what he’d said. Amanda came with me to get started and we got most of the procedure figured out, but called James down to check anyway. We were nervous because it’s a big, scary, loud machine that I only somewhat understand and James warned us that those heavy tanks can start flying around the room, or explode, if the compressor malfunctions. His advice? Press the emergency stop and just walking out of the room…. Neither scenario is, of course, likely to happen, but I was apprehensive of working with the compressor on my own. Now I’ll have to work it for the rest of the week and I’m pleased that I’ll have the process down before students arrive and we become even busier. Speaking of which, the faculty arrive tomorrow, so it’ll be fun to meet them, but it also means more work for the interns as they introduce their research and begin asking for our help preparing for classes. Tomorrow, we’re going to continue diving and working on boat skills. I’m leading the dive in the afternoon, which means I’ll boat sit on Thursday morning. Well, I hope that was interesting, especially for those of you who aren’t fascinated by boats. I’m trying to give a realistic picture of life here, but I know I’m missing details like how wonderful it is to jump into the ocean or the pool after a long day, or watching movies in the intern loft. It’s work, work, work almost all the time here, but we’re finding ways to unwind and when the “work” is driving boats and diving, who can complain?